Image courtesy of GRT Architects. Spivack spent months conceptualizing the space in collaboration with New York-based GRT Architects and securing the elements needed to create the installation with nearly everything donated in-kind. Medium White Tee is an interactive environment where visitors can actually purchase a medium white T-shirt. The limited-edition shirts cost $44 each—a nod to the 44th presidency. Part of the proceeds from T-shirt sales will benefit two nonprofitis—the youth-based get-out-the-vote program The Bus Federation Civic Fund, and MA’O Organic Farms. 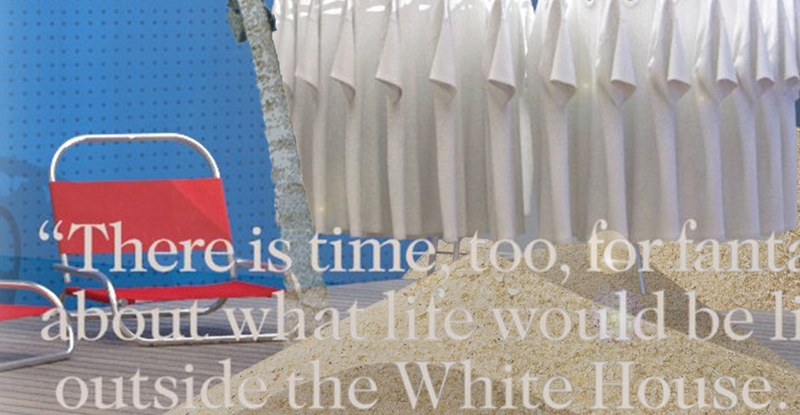 Among the installation's supporters is President Obama’s sister, Maya Soetoro-Ng, who gave her brother the very first Medium White Tee as a holiday gift. Medium White Tee is a Honolulu Museum of Art off-site installation. T-shirts will also be available at mediumwhitetee.com starting Jan. 12. Medium White Tee is a sponsored project of Fractured Atlas, a non-profit arts service organization. Contributions for the charitable purposes of Medium White Tee must be made payable to “Fractured Atlas” only. The value of the Medium White Tee is $44. Any contribution above that amount is tax-deductible to the extent permitted by law. Join Emily Spivack and local organizer Stephanie Hsu for a talk about art and architecture and all things Medium White Tee.